Crown of Eternity LIVE in Winchester, VA! 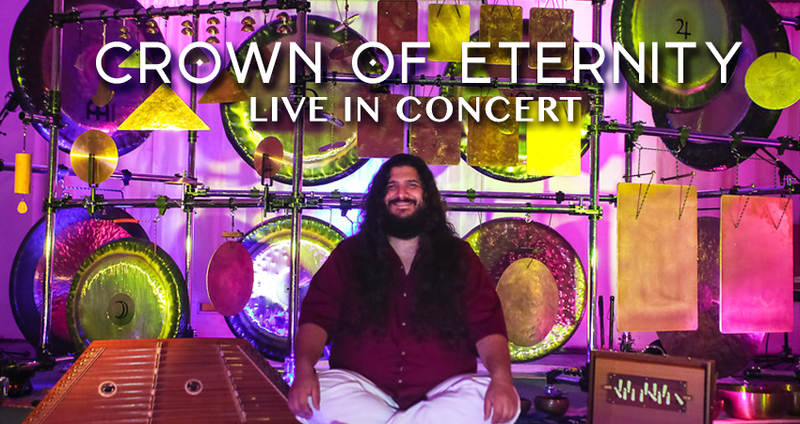 Enter a cosmic journey as Crown of Eternity transports you in a timeless space of sonic bliss through the harmonic resonance of over 90 overtone-rich instruments including Gongs, bells, tuned metal instruments and hammered dulcimer. A deep and lasting vibrational rejuvenation for body and soul; a profound journey through all levels of the self like you have never experienced before. Crown Of Eternity spend their lives serving people through vibration, sound, music, and energy healing. Through their extensive national tours with workshops, classes, therapy sessions, concerts and retreats they have helped thousands of people connect to their life energy, to deeper relaxation and to self healing. They have performed at Sat Nam Fest, Bhakti Fest, the Kripalu Center, and hundreds of yoga studios and wellness centers throughout the United States. They have trained many budding sound therapists on the therapeutic aspects of the Gong. Over the past 20+ years Mike Tamburo has become well known as a multi-instrumentalist and polymath, performing and recording ecstatic and transcendental music as well as folk, ambient and sometimes unclassifiable sounds. He is also an artist and a film maker. As he worked deeper and deeper with the sound current and his own self healing practices, he discovered the healing power of the gong and other tuned metal instruments (singing bowls, bells, sound plates) as well as the healing power of mantra and toning. In 2008 he met Gallina Tamburo, who was on her own journey of healing. Their shared love of ecstatic music, kundalini yoga, the gong, sound therapy, and sacred chanting set the foundation of their relationship, marriage and eventual musical collaboration. In addition to completing their Kundalini Teacher Training at the mother ashram in Espanola, NM and Yoga For Youth Training with Krishna Kaur they have studied with Gongmasters Don Conreaux and Sotantar. They are also trained in the Peter Hess Method of Sound Massage using Himalayan Singing Bowls for healing. They have also studied with John Beaulieu in his Body Harmonics approach of sound healing with tuning forks.